The Centre wants to create space for Joseph Kentenich‘s thinking and educational activity, because these answer the present needs of society, as well as the needs that will emerge in the future from the voices of the times. In order to achieve this, the Centre offers courses, conferences, colloquia, workshops, and recollection days for teachers, and publishes corresponding materials. • To make a contribution towards changing our country. 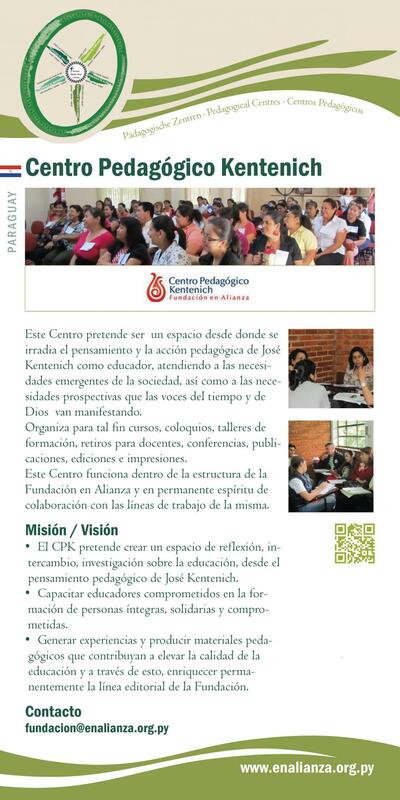 • The CPK wants to offer an area for reflection, exchange and research in the field of pedagogy based on the pedagogical thinking of Joseph Kentenich. • To offer educators the necessary equipment that will enable them to train personalities that have been holistically formed, who are committed and have a sense of solidarity. • To create experiences and draw up pedagogical materials that contribute to improving the quality of teaching, and hence continually to enrich the publishing activities of the “Foundation”.